The leather belt is a most used accessory among men and women. This is not only used as fashion accessory but an important accessory. The particular accessory has a wide use all across the world. Therefore, there is a huge demand for it is an obvious thing. The leather belts come in different colors though; black and brown is the most used color. Due to its huge demand the leather belt manufacturing industry is flourishing. According to the manufacturer of leather belt, the process of manufacturing leather is easy. This is the reason it is a lucrative opportunity for small businessmen. One can invest medium amount of money and can produce leather belts on a large scale. If you want to start a leather belt manufacturing business, no matter how small it is, you need license. Your company also needs registration. The required documents are listed below for a startup business like leather belt manufacturing. ROC registration– In order to start a business you need to register your business along with the brand name under the ROC of the particular state where you are opening your business. The registration process will be done according to the rules of the state. Trade license– Like every other business, trade license is also required for leather belt manufacturing business. You need to get a license from the local municipal corporation. Industry base and MSME registration-In order to start a small business you need to registration under industry base and MSME. The registration under these two will help you to get bank loan. The registration under MSME and industry base will help you in reduction of interest rate. You will enjoy other facilities provided by the government of the state. Export license-To export leather belt overseas you need export license. The Directorate General of Foreign Trade provides the IEC number or export license. NOC-Leather belt of manufacturing does not produce pollutants in the environment. The raw material that is required for manufacturing leather belt is easily available in the market. Therefore, you do not need any official approval from the pollution control board. If you are facing problem regarding obtaining license for your start up business then you can contact to the local office for information. Before you start your business you need to conduct a thorough market research in order to know about the demand of the market. Here are few points that will help you to conduct a proper research. Capacity of the market– To start a new business it is essential to have an idea of the capacity of the market. You need to know if there is saturation in the market. You need to survey based on the type of your business to know the demand of the product in the market. Competition– As the leather belt has a high demand both in national and international market; it is always wise to get basic information about the competitors in the market. This will reduce the difficulty of running the business successfully. Advantages and disadvantages-Like every other business leather belt manufacturing also deals with a number of advantages and disadvantages. Before you plan to set up the business you need to know about the benefits and fallacies of the business. Business Capital– If you have done an adequate research then you can estimate the amount you require to start a business and run the project successfully. An amount of three lakh rupees is a lump sum amount that is required to run a leather belt making business. Market and clients-A business needs a potential market and customers to sell the manufactured product and leather belt manufacturing is no different. Promotion– In order to attract people you need promotion of the product you manufactured. It is essential to earn profit by selling a significant number of products to the customers. Apart from the marketing you need to pay same attention to the manufacturing sector. Here are the required things without them leather belt manufacturing will be impossible. Machine is crucial in manufacturing industry. In order to manufacture belts the following machineries are required. After the machineries raw material is another essential part of manufacturing industry. In the case of leather belt manufacturing, split leather, and chrome stand upper leather are essential. To make holes, attaching buckles you need several hand tools. For packaging of the product you need to buy packaging materials from the market. When it comes to buying machineries online websites like Alibaba and Indiamart comes first in mind. You can buy raw materials from local market. The process of making leather belts easy process. The process is stated below. First you cut the leather into strips according to the required thickness. The strap cutting machine is used to cut the leather. The end part of the leather strap is cut in a slant then the edge is folded diagonally. The glue is applied to the folded part to paste it. After pasting the folded part sewing is done give it a permanent fold with sewing machine. Then the remaining part is cut with a scissor. Then with the help of punching machine holes are made in equal distance. The punching machine is also used to attach the buckle. In many belts a special type of buckle is attached so that they do not need any holes. The size of the belts varies according to the waist size; hence, different types of belt are manufactured. After the manufacturing is done there comes the step called packaging. The products are packed carefully to sell in the market. For the manufacturing business you will have two types of customers and they are either wholesaler or retailers. Through the wholesalers or retailers you will reach to the end user. In order to manufacturing your product selecting a location essential where you can get uninterrupted supply of electricity and water. This will help transmigration. You have keep in mind that machines produce noise. Therefore, you need to set up the factory far from the residential area. The leather manufacturing business requires medium investment. If you face shortage of money you can get financial help from bank after you produce your business plan. To run the leather belt manufacturing business you need skilled laborers. The skilled workers will help you to produce quality product. If you hire unskilled workers you need to train them according to your need. In the case of unskilled workers you can hire them at a lower cost. If you follow all the above mentioned points you will be able to not only establish the business but also run the business successfully. 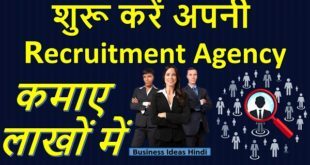 Previous How to start a Recruitment Agency without experience?